Bandar Tun Razak was first settled with homes built for veterans of Malaysia's 1960s UN peace-keeping force to the Democratic Republic of Congo. A few retired soldiers and families still live in the area. Now there are modern villas one to two stories high, playgrounds, schools and retail outlets. Some areas have low-cost housing, mostly apartments, near LRT stations. 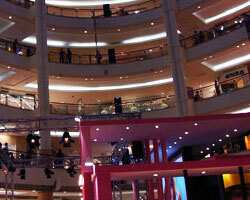 Bandar Tun Razak has a lively nightlife, mostly shopping and dining. Many shops and restaurants remain open until midnight. The town centre at Taman Mulia has a popular night market. The Permaisuri Lake area has playgrounds and picnic areas.